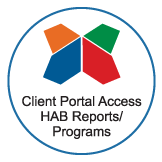 The Highlands Ability Battery (HAB) measures three categories of abilities – Personal Style, Driving Abilities, and Specialized Abilities. For the most part, the Specialized Abilities supplement and support the Driving Abilities. For example, if your Spatial Reasoning Abilities are strong AND your Design Memory (a Specialized Ability) is also strong, your two-dimensional Visual Ability (Design Memory) will support your work with three-dimensional space. Like any rule, there’s at least one exception to the supportive characteristics of specialized abilities – the music combination which asserts itself as a sixth driver. 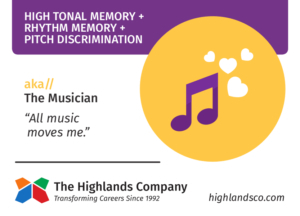 Looking at a combination of three specialized abilities, those who score in the high range on Tonal Memory, Rhythm Memory, and Pitch Discrimination have a drive to use this combination and maintain a connection to music. This connection can be in creating, producing, writing, directing, or something else that is directly related to music. Tonal Memory, the ability to remember tonal sequences, is at the foundation of the musical driver. As it relates to music, it has application in playing instruments, singing by ear, and producing music by memory. The stronger the tonal memory, the greater the need to have an outlet for it. 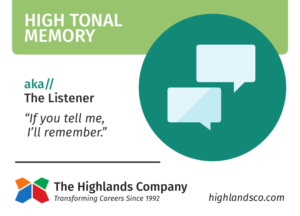 Tonal Memory influences learning, listening, and language learning. 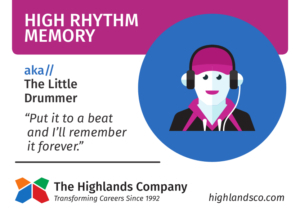 Rhythm Memory, the ability to remember rhythm patterns, relates to the ability to remember the cadence, beat, or rhythm of what you hear. As it relates to music, Rhythm Memory impacts conducting, playing instruments (especially percussion), and recording. When you’re Rhythm Memory is strong, you don’t need that metronome! Like Tonal Memory, strength in this ability has applications to learning, physical activity, and more. 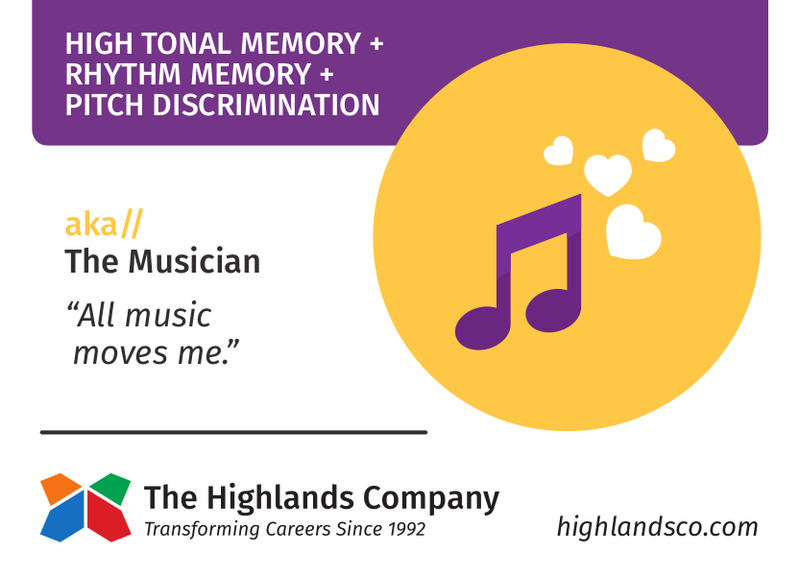 The third part of the musical driver is Pitch Discrimination – the ability to distinguish fine auditory differences. Frequently (but not always), those with strong Pitch Discrimination easily sing acapella and/or experience relative ease at playing un-pitched instruments such as trumpet or violin. Of course, other applications of strong pitch discrimination can be found in replicating the sound of languages, interpreting sounds from mechanical instruments, and other job responsibilities where fine tolerances are required. Joined together, the specialized abilities related to music will create a push to be used when all three are strong. And, to varying degrees, they can create a gentler push to be used when one or more are lower on the continuum. So, can you still pursue music successfully if Tonal Memory, Rhythm Memory, and Pitch Discrimination are not all strong? Yes! As with any ability, skill building and practice can compensate to a point. Will it take more time, effort, and/or energy to acquire and maintain your musical performances? Yes! Equipped with the knowledge of your natural talents, and understanding the requirements of the type and level of performance necessary, you are in the best possible position to know what to do with your talents. Whether you are a member of a local symphony playing first chair trumpet, or a member of a decorated high school marching band, understanding your starting point (natural ability) will help you know how much time, effort, and energy you may have to put into practicing and which type of support you need (e.g., keeping the sheet music in front of you, using that metronome, playing a pitched instrument).